Education departments are using innovative partnerships to find ways to get more children into primary school and beyond. Photo credit: ADB. With low academic attainment, stubbornly high dropout rates and increasingly higher levels of joblessness and poverty to account for, the Philippine government was unable to meet its Millennium Development Goal target of universal access to basic education by 2015. 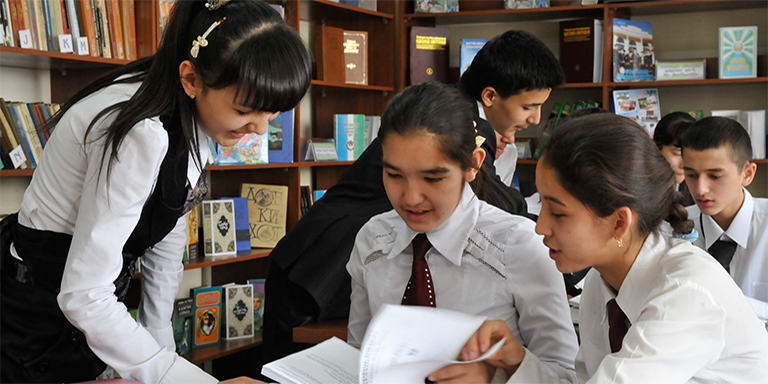 In order to finance and improve the quality and delivery of education, many countries have responded to similar educational roadblocks by making greater use of public-private partnerships. In 2015, ADB embarked on a technical assistance project funded by the Republic of Korea e-Asia and Knowledge Partnership Fund. Implemented by the non-government organization Teach for the Philippines, in coordination with the Department of Education, the objective of the project is to help improve the challenges of basic education by developing an innovative strategy for improving education quality. Teach for the Philippines identifies, selects, and trains promising recent graduates and young professionals and commits them to teach for two years in high-need and under-resourced public school classrooms. The program exposes these carefully selected, highly skilled teacher candidates to the latest developments in educational pedagogy and practice, and includes maximizing technology and the use of internet as a resource in the classroom. Up until 2015, the Philippines had the shortest education cycle in the world, with only 10 years of public basic education and only four years of undergraduate education. All other countries in the world have had 15 or 16 years. Under the Enhanced Basic Education Act of 2012, a student became required to take a full 12-year Basic Education Curriculum. The act was rolled out in four years, which limited institution’s time to fully prepare. This created issues such as classroom shortages, errors in textbooks and late deliveries of books and educational material to students who had already started the school year. The Department of Education of the Philippines calculates that it will need at least 150,000 additional teachers over the next five years to meet the demands of the current teacher shortages - especially under the Enhanced Basic Education Act of 2012. This would require an increase from the current standard hiring rate of 10,000 teachers to over 30,000 teachers annually. Better teacher quality is a key to improving student learning outcomes. Unfortunately, most public school teachers are ill-equipped to overcome the challenges presented to them. To begin with, the training and professional development opportunities available to most public school teachers both during their formal education years and while on the job are largely lacking. Too many of the Teacher Education Institutes that train teachers are inadequate, with very few of their graduates actually passing the professional Licensure Examination for Teachers. fewer than 1% of the 1.4 million grade 6 elementary students who took the High School Readiness Test in 2004 managed a passing score in Mathematics, English and Science subjects, while only 2% of high school students achieved a passing score. The project supports the establishment of the nine-week Teach for the Philippines Summer Institute, an intensive nine-week training program that includes instruction on progressive pedagogy, Philippines curriculum requirements and ways to maximize use of information technology and internet in the classroom. The project finances the research, development and implementation of the Teach For the Philippines Summer Institute, including setup costs, the training of trainers, the purchase of IT equipment, and the development of IT software for training. It also finances the development and implementation of program and curriculum, including development of pre-service training modules in areas such as teaching as leadership, literacy and reading strategies, pedagogy, and subject specific curriculum content, as well as support the sourcing of expert resource consultants to train selected teachers. As part of its support framework, the project develops an interactive, online intranet and communications system to provide ongoing professional development and pedagogical support for teachers, also known as Teaching Fellows, while undertaking their two-year engagement in public high schools. It supports the development of a Teach for the Philippines alumni network, including an online database, social media channels and interactive communications tools. Under the technical assistance, a comprehensive monitoring and evaluation system to track the progress of the Teaching Fellows and school students, in order to identify areas for improvement was developed. Systematic monitoring and evaluation is carried out to identify key lessons learned from the design and implementation of the Teach for the Philippines. The development and implementation of an online monitoring system to track student performance and monitor indicators such as Teaching Fellow and student satisfaction, net enrollment rates, dropout rates, completion rates and levels of functional literacy was developed. School visits and interviews are used to evaluate the implementation progress of Teach for the Philippines and to identify areas needing improvement. The project complements the Department of Education’s Gearing Up Internet Literacy and Access for Students project, which aims to bring Internet connectivity to the country's 6,400 public high schools. This project includes some public elementary schools in the National Capital Region. Because Teach For Philippines teachers benefit from training on how to maximize the Internet as a resource for students, the project complements this initiative. Beyond the Philippines, the organization commits to sharing its knowledge and lessons learned with the 28 partners of the Teach for All network. Many teachers have gone on to work in government or the Department of Education, with their experience, having given them the foundation to create policies about education that are informed by the realities in the public schools, vital in influencing systemic change. Alumni continue to contribute through Teach for the Philippines work through the Summer Institute and information sessions and speaking engagements thereby increasing Teach for the Philippines brand awareness. Often using the online database and newsletter as a platform, the network continues to formally interact with each other and organically amongst themselves to support their day to day work. In this framework, the organization, through a comprehensive system of data-gathering, tracks inputs which include the organizational and training resources dedicated to the recruitment, selection and development of Teacher Fellow who are placed in public schools. Specific to the program side, Teach for the Philippines has developed a Transformational Leadership Continuum, and tracks and identifies indicators for quality of academic instruction and the character and life skills development of students as well as community engagement of and by the Teacher Fellows. Beyond the fellowship, Teach for the Philippines tracks alumni engagement and professional career trajectory to evaluate their longer-term contribution towards education reform. Increase ratio of tablets to Classroom, instead of tablets to Fellow taking into account challenges in reliable electricity and the lack of internet access. Capacitating Public School teachers with information and communications technology requires a back to basics approach at incorporating simple yet effective software and tools in the schools. Continued development and training for Alumni so they can grow into key leadership positions to influence systemic change. Karin Schelzig focuses on poverty analysis, social protection, gender equality, and civil society participation. In nearly 10 years with ADB, she has managed projects and policy dialogue with governments and development partners across the Southeast Asia region to improve early childhood development, education and training, health and nutrition, social safety nets, access to rural basic services, and women’s economic empowerment.